Not mine and only 20 grand. If anyone goes to look at this car, please photograph the steering wheel and post the pictures,please. It looks like it may be the rare 48400-E4100 leather covered wheel. Very rare - very valuable. Would love to see more detailed pics to verify. Thanks! Low rez Craig's list photos really wizz me off. Could be a real nice car. 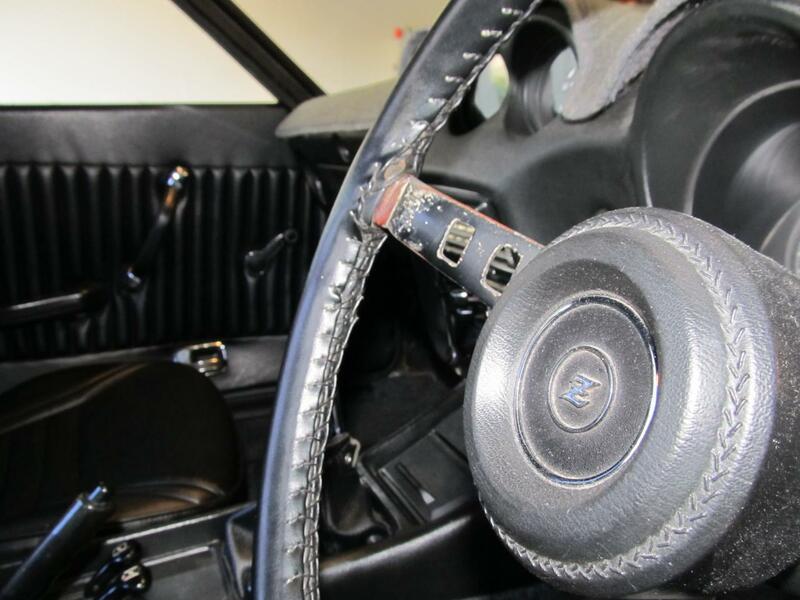 Sadly it's not the super-rare option 48400-E4100 leather steering wheel ( not to be confused with the Sports Option 'Datsun Compe', which had a 'leather look' moulded urethane rim ). It's just the stock wood composite wheel with a loose leather cover stitched around it. Horn push 'Z' is the correct blue-painted version - correct for this model. 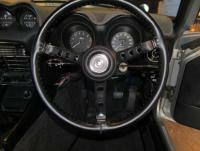 The wheel should be less dish ( ie flatter ) than the Export steering wheels. Steering wheel re-trim probably done by the same outfit which recovered the door panels? Mid January to early February 1971 build date I reckon. Quite a nice car. Many of the mods could still be reversed. Thanks for the pictures! Leather aftermarket cover, I'm afraid. Well, there's your answer, Alan. Did you find out if they have the original engine? The ad says they think it has an L28 installed, but may have the original engine in storage. Does it still have the original five speed transmission? What does the dash look like under the cover? Beautiful car indeed. Unfortunately Fairlady Z's, at least the ones in Japan, did not receive an engine code on the engine bay plate. To verify, you can general guess the range of the engine code based on build date. Like my Fairlady, it didn't suffer from the addition of the rear red reflectors! 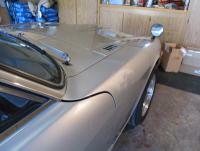 Mostly all Fairlady's I have seen in the States had this item added to be road legal in the 70's. The door panels, steering wheel, front grill, among others will need to changed back, but awesome condition! Unfortunately Fairlady Z's, at least the ones in Japan, did not receive an engine code on the engine bay plate. To verify, you can general guess the range of the engine code based on build date. Yes, but if it's a S30 it should have an L20a, not a L24, so if the engine in storage is an L20a, that is probably the original engine. Like my Fairlady, it didn't suffer from the addition of the rear red reflectors! 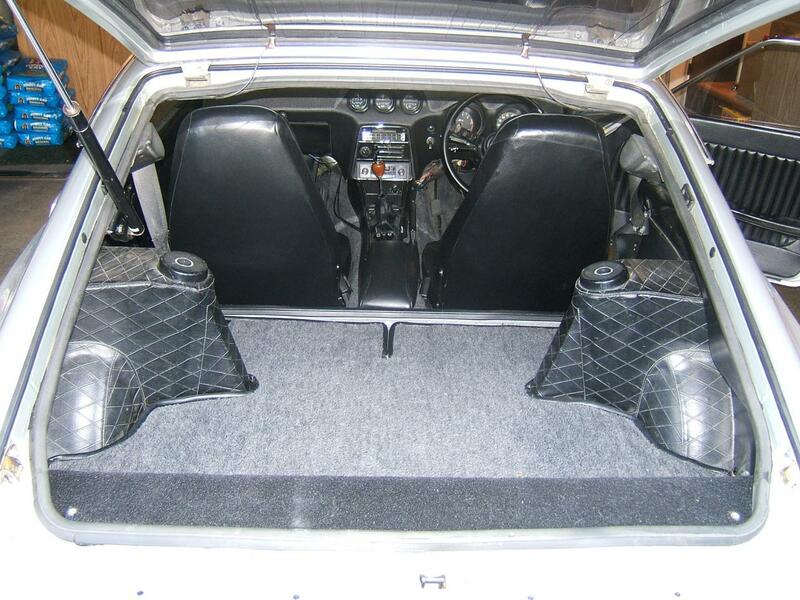 Mostly all Fairlady's I have seen in the States had this item added to be road legal in the 70's. It must have varied by state, or maybe it was just California cars that had to add them. Most of the early Fairladys I have seen in the US didn't have the rear reflectors. i asked about the engine, but they were not 100% sure. they only assume it was the original engine and matching transmission because the owner (who has passed away) was they type of person that would not store "junk"... they told me that the owner would buy extra parts for the car just in case they were not available in the future. they said that the storage locker contains a whole rear end or rear axel part, a head, the block, a cam, seat covers and cushions, whole ac unit, the blower and condenser, z wheel caps, etc.. i cant remember the rest. the dash has 2 cracks, one small one near the driver side and a larger one on the passenger. but still in great condition for a 40 year old car. There do appear to be some things that it appears someone added to this car. We have one known to be correct in most aspects as a JDM. No bumper overriders, no decals like that on air cleaner, and those louvers in the small doors next to the hood are not stock. At least not by our car, nor the pictures in the Nissan books. And of course those are aftermarket wheels. Radiator hoses are aftermarket replacements as are the clamps. Ours is appraised at well over the $20k he is asking. There are not many of these left in the USA and very few have been "restored". It can be done if you are willing to chase parts all over the world. Are trying to sell a car, indirectly? The post you replied to is over two years old. If so, say so. 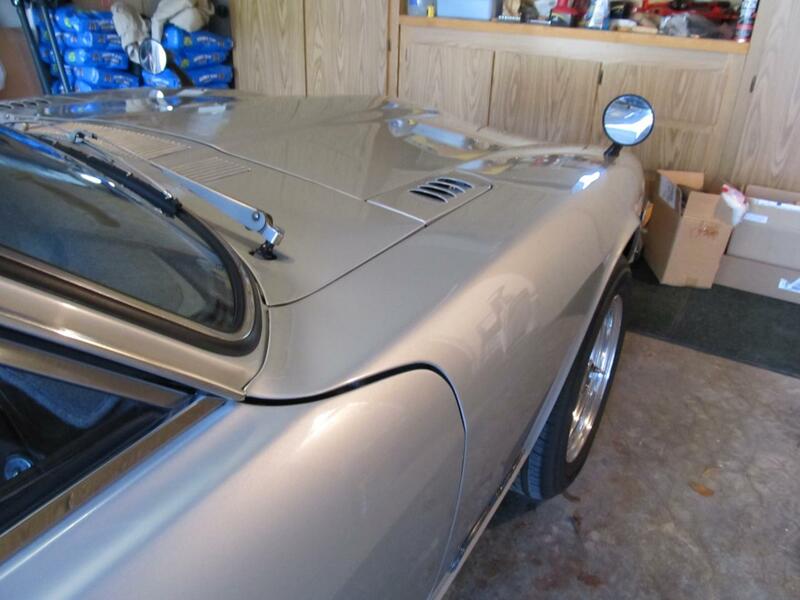 Not selling, just sharing information about a 1971 FairladyZ-L that is mostly correct. No offense intended. A new thread with a link to this one might work also. 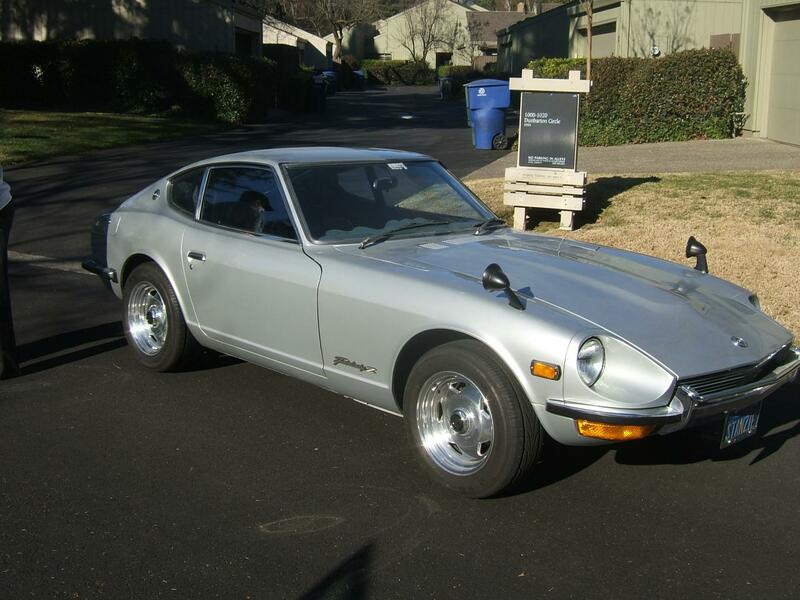 The engine your 1971 Fairlady Z-L left the factory with was called an 'L20A' by Nissan. The 'A' suffix was added to the L20 sixes when the L20 four debuted ( 'L20A' = 6 cyl, 'L20B' = 4 cyl ) in an attempt to avoid confusion. You won't necessarily see the suffix codes written anywhere on the car itself. I have two Nissan Fairlady brochure booklets, both are in Japanese. I got one on leave in Japan, in Nov. 1971, A 12 page brochure. It showed 6 options for the Fairladys. the 240ZG, 240Z-L, 240Z, FairladyZ-L, & FairladyZ. A rally clock, radio, chrome rimmed headlight bucket lenses, rear defogger, rear spoiler, & hubcaps. For the 70 Fairlady 432Z, FairladyZ-L, and FairladyZ they had 12 pictured. 8 track, foot rest, spoiler, rear window defogger, bumper overriders, side lower racing stripe, what looks like black vinyl top, custom exhaust tips, rectangular fog lights, radio, rally clock and two others showing lower doorway opening aluminum strip, and the flasher button on the turn signal. Also showed 7 colors. The 'A' suffix was added to the L20 sixes when the L20 four debuted ( 'L20A' = 6 cyl, 'L20B' = 4 cyl ) in an attempt to avoid confusion. Hi Alan, wasn't the A suffix added to distinguish the L20A from the earlier L20 (1966 to 196? ), which had a different valve cover design? Wikipedia (for want of a better source) tells me the L20B didn't debut 1974, yet from what I can tell the L20A was called that earlier than 1974. Yes, you're right. I don't think I put that very well did I? The L20 six got the 'A' suffix well before the L20 four arrived with the 'B' suffix. The story that was related to me when I looked into this was that it was a case of killing more than one bird with one stone. Yes, they needed to differentiate between the early style L20 six and the updated L20 six, so they started to use an 'A' suffix on the updated design. A good illustration of this was in the factory parts manual for the GC10 Skyline: This had sections for both the 'early' / 'old' type L20 six and the 'new' L20'A', as the earliest GC10s were equipped with the 'old' type L20 sixes, and then they switched to the 'new' L20'A'. It must have been quite confusing at the time to have the same model of car fitted with two versions of what was essentially the 'same' engine. Those first 'new' L20'A's had the 'A' stamped into the pad on the block that carried the engine number. No doubt this was an effort to make sure there was no confusion, but it's possible to see Nissan's period advertising and other technical descriptions not differentiating between the two types. I don't know whether that was deliberate or not? And just a year or so down the line ( late 1969 ) Nissan were churning out what were clearly 'new' type L20As without the 'A' being stamped on the block as part of the engine number. Quite confusing. Again, the story I was told was that the 4-cylinder L20 was 'on the drawing board' - or at least being mooted - during the 1968/9 period when the L20 six was updated, hence the 'A' and 'B'. Even if they were not ready to make it yet, we can imagine that they could see a 4-cylinder L-gata engine of two litre capacity being necessary somewhere in the near future. If that wasn't part of a long-term plan then it would have to be a big coincidence, no? One thing is for sure: Those 'A' and 'B' suffixes did the job of differentiating between the six and the four, and the 'old' and 'new' sixes. But anyway, Kerrigan's Fairlady Z-L was fitted with the 'new' type L20 six, which the factory called an 'L20A' at the time. Great info as always. Thanks Alan. Don't think the louvered access hatches are stock ... ours doesn't have them and it's an original car. 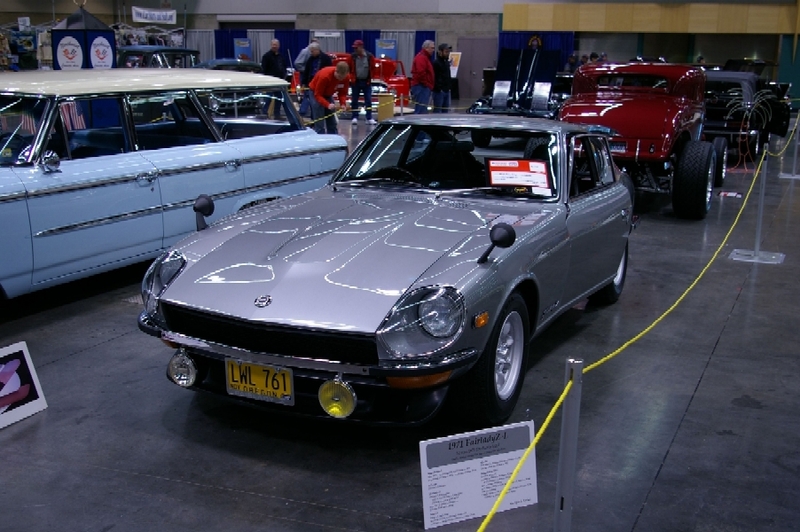 Nice Fairlady however; there aren't many left in the US ... just heard of another one wrecked and scrapped. Scored some parts off it. Nope. 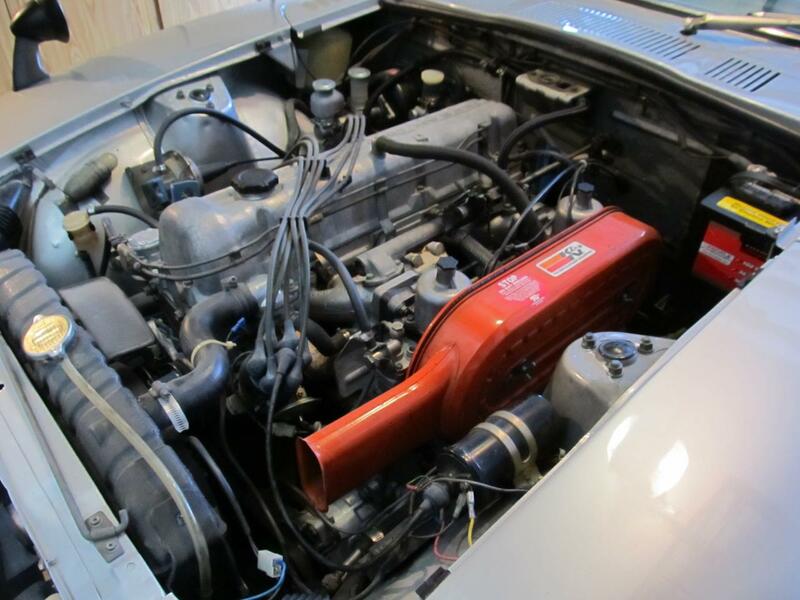 The S30 has an L20 engine, with dual sidedraft Hatachi carbs, not the single downdraft carb on the L20A. At least according to the stamp on my engine block with it's dual carbs (as the car came). If it's a JDM FairladyZ it will not have rear side markers. And the front side markers are tied into the turn-signal and flash with them. That's stock as well on JDMs. This one anyway. All in all, nice car.